"Wouldn't it be cool if one of those stately, regal statues of an ancient Egyptian cat could come to life? Well, if it did, it would look just like me, Giorgio!" 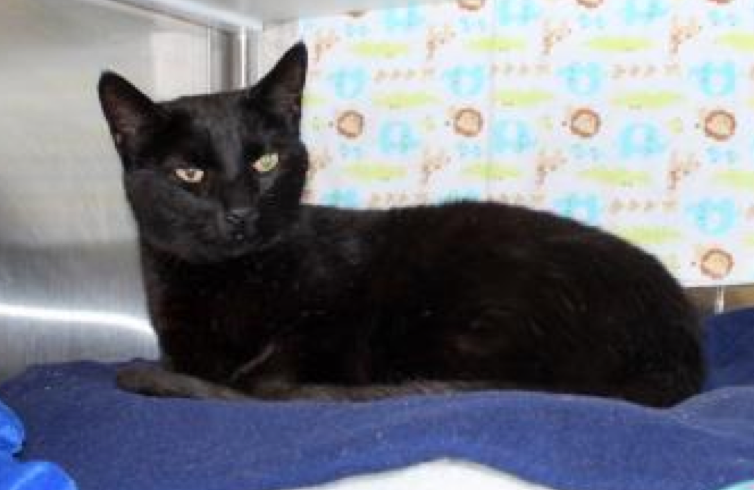 "I'm an amazing, sleek black cat with soulful, expressive golden eyes. I came to Wayside from another shelter that was low on space. I'm a friendly boy with a cute little meow. 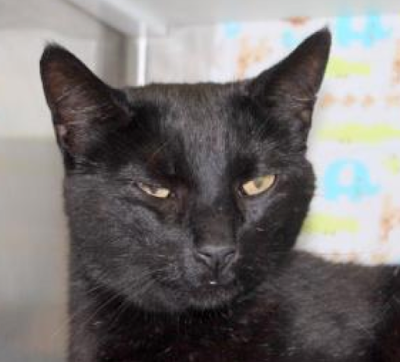 I'm a calm, sweet guy who loves to be petted, and especially enjoy being scratched on my head and back." "I like to play, too. What's my favorite toy? All of them! You might have noticed that I'm 7 years old, but that is barely middle age for a cat. If you take good care of me, we can expect to have many happy, healthy years together. When I had my Felineality test here at Wayside, they told me I am a Leader of the Band! That means I scored high in valiance and sociability. In other words, I'm an outgoing, confident cat who loves people. "Head butts ... Sweetheart!" and "100% great cat!" But you don't have to take their word for it -- I'm right here at Wayside, waiting to meet you in person! Giorgio's available at Allie's Alma Mater, Wayside Waifs. Giorgio sounds like a pretty amazing guy! You sure look like a little sweetheart, Giorgio! You are a handsome boy, I know you will get a forever home soon. We will help get the word out on Georgio so he can get a forever home!